thejewelrymaster Store undefined Information: ID # 83013 Diamond Weight: 1.25 Carats Stones: 19 Princess Cut Diamond / 2 Brilliant Round Diamonds Clarity: I Color: G-H Setting: Prong / Channel Size: Available in any size Metal Type: 14KT White Gold Metal Weight: 7.4 Grams Top Width: Bottom Width: Estimated Retail Value: +$5,200.00 New Low Price!!! $2,599.00 Description: Feast your eyes on this beautiful treasure which is entirely hand crafted in pure 14KT white solid gold. The engagement ring is centered with 1 prong set princess cut diamond, surrounded by 2 prong set brilliant round diamonds, and 6 channel set princess cut diamonds. A custom made wedding band completes the design and contains additional channel set princess cut diamonds that line up with the engagement ring and complement it perfectly. The total weight is 1.25 Carats. All stones are a blinding white G-H color and I clarity. 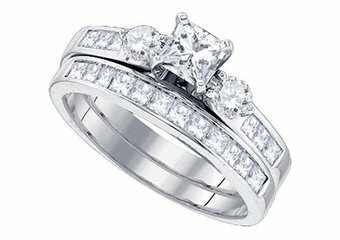 Don't miss out on the opportunity to buy on this diamond ring and matching wedding band set for a fraction of the cost. Your loved one will cherish this fine diamond ring for a lifetime! FREE Re-Sizing A Gift Box Accompanies each purchase & Professional Appraisal Jewelry Masters strives to provide an unparalleled level of gem quality, exquisite design, with the finest craftsmanship, and personalized service at the lowest wholesale prices. Our goal is to become the best service oriented online retailer of quality jewelry by building trusting, and longstanding relationships with our clients. With over 20 years of professional jewelry experience, ranging from wholesale diamond selling to operating a full-service online and retail jewelry store, we assure that every item is of the highest quality, attended to with personal care, and guaranteed to meet your satisfaction. It is our desire to set the standards in online and retail jewelers for honesty, integrity, and competence. Please view our feedback profile and buy with confidence. One of our friendly representatives are here to assist with product questions. E-mail: Press the "Ask a question" link within eCRATER Telephone: 1 (310) 628-3534 Click HERE to see rock bottom prices on diamond jewelry in our eCRATER Store. Click HERE to view our collection of similar women's rings! JEWELRY MASTERS Quality YOU can trust! Thank you for looking!